Here on the edge of the Arctic Circle man has not been able to tamper with nature much. The land is still unspoiled and little changed since the arrival of the first humans. There are over 200 volcanoes, geysers, glaciers, snow-covered mountains, green valleys and roaring waterfalls. 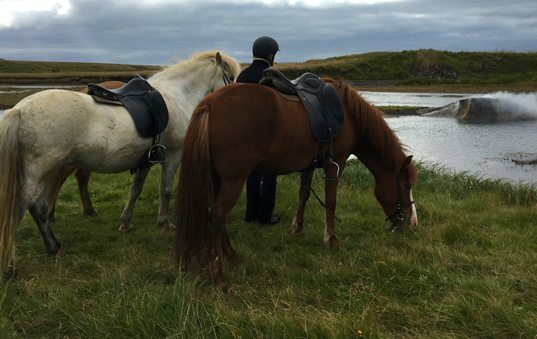 Horseback riding in Iceland is an integral part of the traditional Icelandic scene and the naturally gentle Icelandic horse provides excellent riding opportunities — especially through the wild and otherwise inaccessible areas of Iceland. A purebred descendant of its Viking ancestors, the Icelandic horse is a product of isolation and a thousand years of breeding for good riding qualities, resulting in a gentle, friendly disposition and calm manner that make them a delight for anyone to ride. Their two unique gaits, the tölt and the pace, provide a remarkably smooth way to travel over rugged terrain, making long hours in the saddle more comfortable. The tölt is what makes riding Icelandics such a pleasure, with its flowing 4-beat gait providing the sensation of floating while being seated firmly in the saddle. "The uniqueness of the country, its people, and its horses are captured in this riding adventure as you trek upon these gentle horses through pristine, rugged and majestic landscapes of this beautiful land called Iceland. There is no detail overlooked by Anita"